Leslie Jerkins Reads: The Best Week(s) of the Year? The Best Week(s) of the Year? Probably not really the actual best but definitely some of the best. The Jerkins family loves us some March Madness. I love the beginning of the NCAA tournament…there's so much possibility, for every single team. Our Tigers (and my Longhorns) are fortunate enough to be in the tournament most years, and we’ve been fortunate enough to attend a good many games. School, job, and baby keep us home this year, but let me tell you…I’m pretty convinced that there is almost NOTHING you can attend that is quite as much fun as the NCAA Tournament. I’ve been able to go to two Final Fours (’03 New Orleans with the Longhorns, ’08 San Antonio with the Tigers), and every other round various times, cheering on both or either Tigers and Longhorns, in various cities. In the future (if we’re able), our children’s spring breaks will probably be filled with tournament-driven trips to see les Tigres. For posterity’s sake, here’s my bracket! 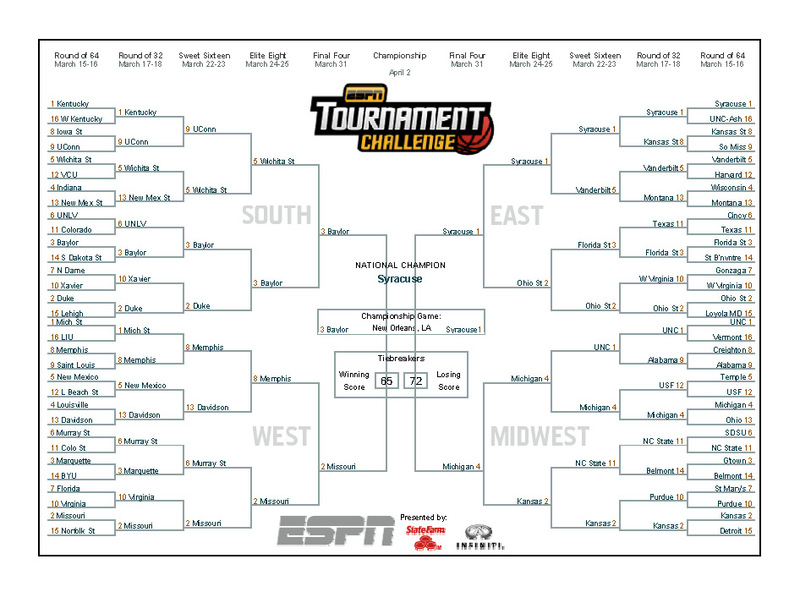 You'll notice I have Kentucky losing early, and Memphis in the Elite Eight. Emotional guesses? Maybe. Some picks are attempts at educated guesses…some are instinctual, some are sheer preference, and some are decided in my famed hurry-up-and-make-a-decision style. That's the FUN of a bracket--everyone pretty much gets their brackets "busted"! Anything goes and ANYTHING can happen. It is "madness" after all. We’ll see what happens. Enjoy! p.s. how GREAT is it to start the week off with lots of bare branches in the skies, and end it with lots of budding green?